Applications will continue to be accepted from non-profit groups on a rolling monthly deadline of the third Monday. The UDSB Committee has earmarked $5,000 for projects which support the goals of the Monarch Butterfly: Fostering the Flyway by the Byway initiative. BUTTERFLY SCULPTURE: Local artist Todd Lantz is shown creating a mold for a series of butterfly sculptures that will be placed strategically along the Upper Delaware Scenic Byway through a grant project submitted by the Greater Barryville Chamber of Commerce and the Hayraisers 4H group. 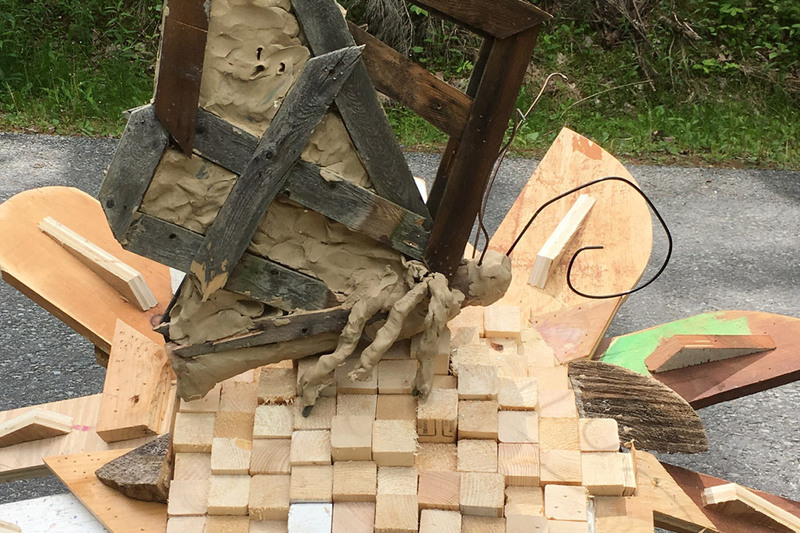 $325.00 to create a series of butterfly sculptures that will be placed strategically along the New York State Route 97 Upper Delaware Scenic Byway. 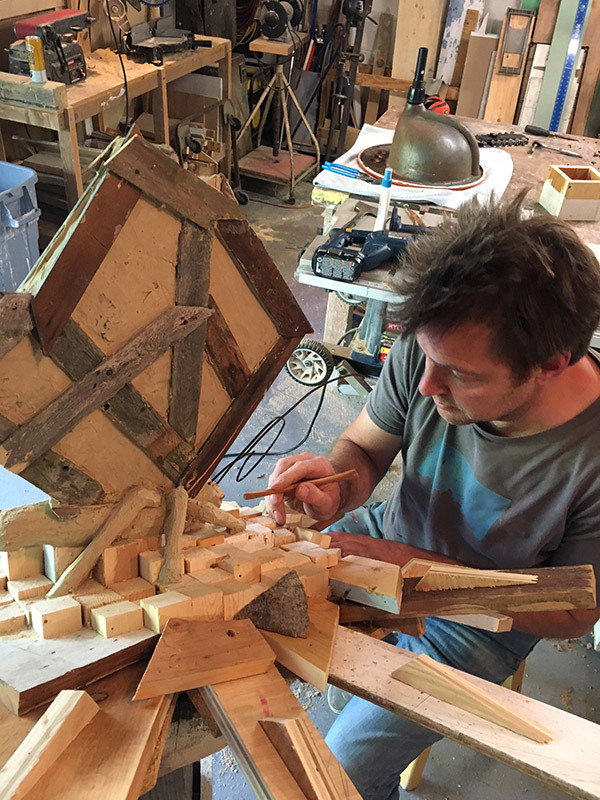 Local artist Todd Lantz is creating a mold out of plaster and urethane that can be cast multiple times. The installation that is subject of this grant will be in the gardens near the River Road cul-de-sac in Barryville. Once in place, the sculptures function as artwork to bring focus to monarch butterflies and may also be incorporated into a scavenger hunt to locate as many as possible for a prize. The total value of this project with a $325 cash match from the Greater Barryville Chamber of Commerce, a grant from Sullivan Renaissance, and in-kind donations by the artist for this original piece is $2,380. $777.00 to purchase materials to conduct a seed bomb activity at three summer festivals to teach participants of all ages about native plants and the dependence of Monarch butterflies and other pollinators on them. Seed bombs are made from recycled paper and water, which will be combined in a blender to form a ball around the seeds that will bloom into such plants as milkweed and Black Eyed-Susan to create new habitat. Volunteers will staff booths at the July 15 Zane Grey Festival in Lackawaxen, PA; the July 23 RiverFest in Narrowsburg, NY; and the Aug. 5-6 Festival of Wood at Grey Towers in Milford, PA. The total value of this project with matching funds for volunteer training, staff oversight, planning, preparation, and labor is $2,883.92. $35.00 to offer two classes in seed ball making on Aug. 9 and 11 at the Delaware Youth Center in Callicoon to educate the children of the Upper Delaware River Valley about the monarch habitat and the importance of preserving it. The class will start with reading the book, “Monarch Butterfly”, by author Gail Gibbons as an introduction, followed by discussion, then get instructions to make from a kit 100 seed balls which participants will take home as well as planting some at the center. The Delaware Youth Center donates the space for their classes and a member of their paid staff, Julie Valentin, will teach the classes. Completed applications for Promoting Butterflies on the Byway Grants may be returned electronically or to UDSB, P.O. Box 127, Narrowsburg, NY 12764.